There was a point during the opening sequence of &#8220Did You Do This? No, You Did It!” where I lost track of who was killing who. Was that one of Gerhardt’s men who just knocked off one of the Kansas City mob, or vice versa? Then I realized my confusion was kind of the point. This is a bloody war, where there will be many casualities and no real victor. The episode’s title reminds us that everyone is pointing the finger at everyone else and no one is taking responsibility for the current gory state of things. The night’s finest performance belonged to Rachel Keller whose Simone just broke my heart. In a scene reminiscent of when Silvio took Adriana for a ride on The Sopranos, Bear discovers that Simone has been sleeping with the enemy (literally). Simone goes from denying this, to trying to convince Bear she could be an asset to the family, to begging for her life. “I’m the victim here. What was I supposed to do?” she asks her uncle. “Hush now. It’s already done,” Bear tells her as the show employs the most disturbing use of “Danny Boy” ever. Bear has been the quieter brother—not a violent misogynist like Dodd, nor a hotheaded fool like Rye. Even though he loathes Dodd, betraying the family is betraying the family and the punishment is death. (Or maybe this was all to get back at Dodd for landing Charlie in jail?) And Simone, who escaped death at the hands of Mike Mulligan, couldn’t escape her uncle. Floyd survived the ambush by the Kansas City mob, but is grieving for her husband who died in the attack. While smoking a pipe in the interrogation room, she decides to become an informant on the mob in an effort to save her family and end the war. But Floyd lost control of her family long ago (her sons clearly don’t listen to her, or respect her), and this Hail Mary pass is unlikely to save things. Lou send Karl, who declares himself to be the Breakfast King of Loyola, to look after Betsy and Molly. As I’ve said before, Betsy is the only one who seems to truly know that she is dying. She knows she got the sugar pill. Karl tries to give her a pep talk about all that John McCain survived but Betsy has made peace with her fate. It was another strong episode for Nick Offerman who traded in last week’s steely resolve for heartfelt compassion. In the night’s most perplexing scene, Betsy goes to her dad’s house and finds a room filled with ancient symbols. (It definitely had that feel of Carrie’s crazy boards on Homeland). I don’t know what this could mean, but it made me suspicious of Hank for the first time. (Is there a more sinister reason he didn’t check on Peggy?) Also the show is doing such an interesting job with Betsy’s fate. I’m confident she is going to die, but I’m still not sure if it will be the cancer that takes her, or the Gerhardts, or the Kansas City mob. Headquarters is not pleased with how things are progressing under Mike’s leadership and sends the “Undertaker.” But Mike takes care of the “Undertaker” and his men seconds after they enter the hotel room. It was a scene that epitomizes what I love about the series. Lots of build-up to the “Undertaker,” but he’s dead moments after we meet him. Peggy, Ed and Dodd are missing for the entire episode, until the final moments when Ed calls Mike and tell him he has Dodd Gerhardt in his trunk if Mike wants him. So now Ed, who had kind of bumbled along through his crimes, is taking a proactive role. Previously he killed in self-defense, but keeping a man captive in the trunk of your car takes things to a whole other level. 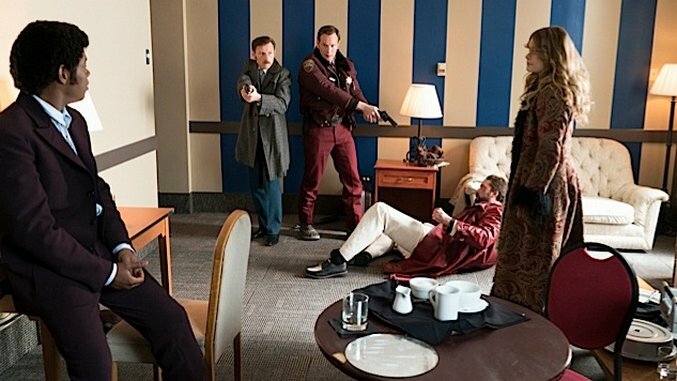 Yesterday FX picked up Fargo for a third season. Do you think the show will continue the same pattern, and have a character that links the second season to the third? A young Karl perhaps? “What did they call those Russians? Sleeper agents?” This is clearly the show’s way of subtly letting me know that they also think a crossover between Fargo and The Americans would be a great idea.